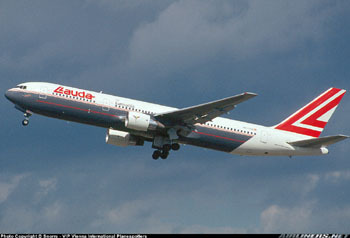 A Boeing Model 767-300ER, powered by Pratt and Whitney PW4000 engines and operated by Lauda Air, experienced an uncommanded thrust reverser deployment of the left engine during climb out from Bangkok International Airport in Bangkok, Thailand. The reverser deployment resulted in loss of airplane control and subsequent in-flight break up, killing all 223 passengers and crew. It was later determined that the engine thrust reverser's efflux pattern associated with high airspeed and high engine power caused significant airflow disruption over the upper wing surface. It was also established that this potentially catastrophic lift loss issue was not limited to the Model 767-300, but was common to many other similarly configured airplanes.